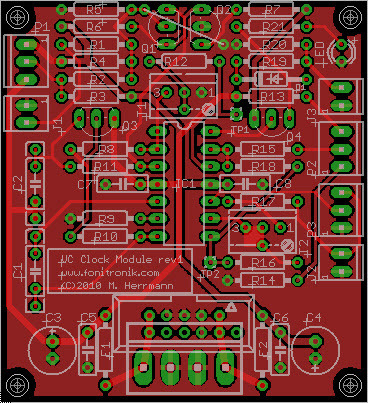 for use with my KLEE and VCPS-8 sequencers i always wanted a Clock with PWM. since in those sequencers the length of the trigger out depends on the duty cycle of the clock, PWM of the clock will add live to the sequences. the CV Clock features a manual speed control, CV in for speed with attenuator, manual PW control, CV in for PWM with attenuVERTER(! ), clock output, and an indicator LED. the VCO creates a falling ramp. the clock pulse is derived from that falling ramp using a comparator, thus you will not have a change in timing when doing PWM! i am taking pre-orders until 7th of FEB. PCBs should be available mid/end of february. I would be interested in at least 2, possibly 3. Zwo Platinchen für mich bitte. How may I be of disservice? You know...I'm a huge fan of your products, fonik...but so far I haven't gotten around to building any of them! That day will come, but it'll still be a while; I'm collecting projects for later while slowly working away on a prioritized list. I'd be in for 2 please. Would it be possible to run two (or more) of these pcbs in sync to each other? This would make it much easier to play around with two (or more) sequencers running on the same clock but with different pwm-settings. Sounds great Matthias, I'll take half a dozen if this goes ahead. i hear you. however, the design and prototype is already finished and tested as is. what you could do was to use only one VCO core of the 1st PCB and then route it via the TP1 wire pad to the comparator section of the 2nd PCB (or to all the others, you wanted to use. with a little bit more tweaking you could even use a switch for master/slave mode. That`s exactly what I had in mind! Glad to here that it`s doable in that easy way. What about an external input to the comperator section? For example,Din-Sync fed into the comperator,possible or not? one could add multiple inputs to the comparator, sure. however, feeding a logic signal into a comparator does not make that much sense, doesn't it? I kludged an analogue switch say one section of a dg412 at c2 to provide a dump cct and sent a clock signal to the logic in would that provide a reasonable sync to a master ? I maybe completely wrong but the switch would only need to short c2 ? i would think your approac would be a kind of reset? i dunno. i will try some options tonight. however, i'd rather tried to sync it via IC1B.